On the same day that President Obama paid homage to Americans who died fighting in World War I on a visit to a cemetery in Belgium, I saw the monument honoring Canada's war dead that stands in front of City Hall in Toronto. 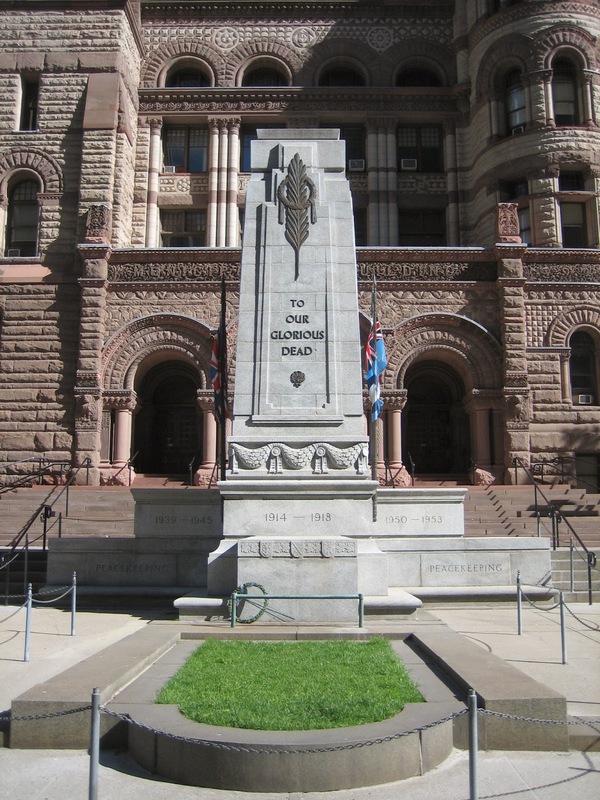 The Toronto Cenotaph, modeled after a similar monument in London, was originally designed to honor only those who died in World War I. Thus, the Cenotaph bears the names of the places in Belgium and France where Canadian soldiers fought: Ypres, Somme, Passchendaele, Amiens, and others. After World War II, however, the dates of that great conflict were engraved on the monument. After all, Canadians fought and died in that war, too. The Cenotaph also bears the dates 1950-1953, testifying to the fact that Canadians died in the Korean War. There are no other wars noted on the Cenotaph, but at the bottom--engraved on both sides of the base--is the word "Peacekeeping." It is a reminder that Canadians have served all over the world in peacekeeping missions and that some have died in the course of those missions--in the Golan Heights, in the Belgian Congo, in Cyprus, in Haiti, and elsewhere. Dulce et decorum est pro pax mori.